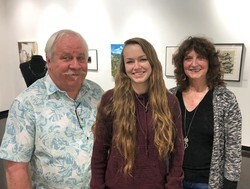 David Cozadd, president of the SFA Friends of the Visual Arts board, and Linda Mock, FVA scholarship committee chair, present the Gary Parker Art Scholarship to Shelby Locklin, junior sculpture student from South Lake. NACOGDOCHES, Texas - The Friends of the Visual Arts scholarship committee at Stephen F. Austin State University has selected South Lake junior sculpture student Shelby Locklin as this year's recipient of the Gary Parker Art Scholarship. Jeff Brewer, assistant professor of sculpture in the School of Art, nominated Locklin for the award. "As Art Alliance faculty advisor and sculpture professor, I have had the pleasure of knowing, teaching, working with and mentoring Shelby for the past two years," Brewer wrote in his nomination letter to the Friends of the Visual Arts. "She is a talented student and budding young artist. Shelby has a very special gift; she has the ability to see the world in three dimensions. She is a sculptor." Brewer said that Locklin not only has a wonderful gift, but she also has the diligence and drive that often escape the creative person. "What genuinely excites me about Shelby's work is her integration of technology into her artwork," Brewer said. Locklin participates in all functions of the art department, be it working all day at SFA Art Day for high school students or giving campus tours at Showcase Saturday to incoming freshmen. Brewer also described her as "a talented scholar," having maintained the Dean's List for two years, staying active in Art Alliance and maintaining an active studio practice. "She always represents SFA in a most professional way, and I believe her attitude, skills and commitment will take her far," Brewer said. "She is an all-around great person. I have seen firsthand the dedication and diligence Shelby brings to the table around the School of Art, having worked with her on several projects in her time at SFA." The SFA Friends of the Visual Arts established the scholarship in honor of the retired SFA School of Art faculty member who was employed at the university for 31 years. Parker not only taught courses but also directed the school's Summer Art Academy program for children and served as the gallery preparator. The FVA has established scholarships in the name of retiring SFA School of Art professors who were employed in the School of Art for minimum of 10 years before retirement and who contributed in a significant way to the mission of the Friends of the Visual Arts board and its fundraising activities, such as consistently donating art for fundraisers, by providing monetary assistance, or by serving on FVA committees or board.